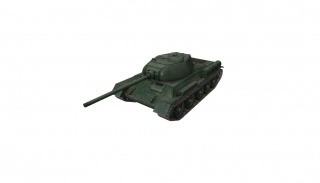 The T-34-1 is a Chinese tier 7 medium tank. En 1954 el gobierno chino consideró la posibilidad de iniciar la producción del T-34-85 en China. Al mismo tiempo, ingenieros chinos propusieron un proyecto alternativo: el T-34-1. Aunque basado en el T-34-85, el compartimento de la transmisión y la suspensión del T-34-1 iban a ser recolocados, reduciendo el peso general y bajando el chasis. En 1954 se desarrollaron varios diseños del vehículo con diversas torretas y armamento. Sin embargo nunca se construyó un prototipo. The T-34-1 leads to the T-34-2. 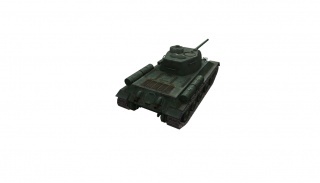 Once fully upgraded, the T-34-1's handling is very similar to that of the Type 59. It has very good maneuverability and speed on flat terrain, but its low engine power makes hill climbing a bit challenging. It possesses the second highest alpha damage of 250 among all tier 7 medium tanks, bested only by the A-44, and combined with very good penetration of 175mm, the T-34-1 has no problem penetrating most of the tanks that it can encounters. However, its low accuracy and long aim time make it ineffective at long range and against tougher high Tier tanks. Since it only holds 34 shells, it is essential to make every shot count. Unlike the Type 59, the T-34-1 cannot mount a vertical stabilizer, so the Snap Shot and Smooth Ride crew skills are important for increasing this tank's overall gun handling. 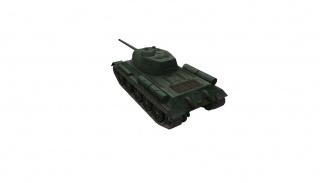 With the second turret, the T-34-1 is a multi-role vehicle. It does have the hp/t to flank targets, but thanks to the thick turret front, it can also go hull-down behind cover or even other tanks and prove itself a reliable roadblock, as well as act as a decent mid-long range sniper, and the long aim time doesn't matter since you'll get plenty of time to aim while the gun reloads and you're in bush cover. It's effectively a highly mobile scout sniper, and despite what some might say, the Chinese mediums are not brawlers. Your real strengths lie in being able to passive scout effectively, and quickly do a lot of damage to key enemy targets early on. Aim in fully using the camouflage, and the moment that you let the shot fly, get back to avoid damage and having to contest other tanks in a DPM war, a fight that you'll lose almost every time. Even if you do win against a lower Tier tank, you won't come out unscathed. The turret can bounce some shots, but your primary defense against getting shot is to use the camouflage and speed to not get shot in the first place. Learning to play this tank well in this fashion will greatly help with the T-34-2 armed with a 122mm heavy tank cannon, as it's effectively a Tier 8 version with more accentuated strengths and weaknesses. The compact design of this tank is a pro and con. It's a pro in terms of you being a smaller target and can take cover more easily, but the con is that the compact design of the tank increases the chance of singular or more frequently, multiple module damage. The turret design allows for frequent ammo rack damage if shot from the sides which can be alleviated with a "Wet" Ammo Rack as well as Safe Stowage crew skill. If you have unlocked the IS-2, the top gun will be already available, but you can't mount it yet. The Tier 8 12150L engine carries over from the Type 58. 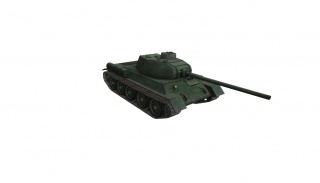 The Tier 7 T-34-1 model 2 turret should be researched and mounted as soon as possible, as the upgraded armor and rounded slope of the turret will provide for some much needed defense. The upgraded suspension will be needed to mount the tier 7 100mm 44-100JT gun. Once you have the upgraded suspension get the 100mm gun as soon as possible as the significant boost in penetration as well as damage will allow this tank to show its true colors. Finally, research the tier 10 A-220A radio.